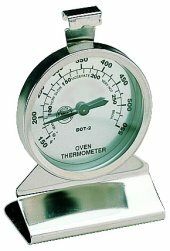 The Comark DOT2AL Oven thermometer is made from high quality metal to withstand and measure temperatures between 200°F to 550°F or 100°C to 280°C. Featuring a bold and easy to read dial display with the bonus of visible colour zones for quick reference and a design that supports hanging or standing, this oven thermometer makes cooking culinary masterpieces easy whether for use at home or as part of an industrial kitchen. Good website . Fast and efficient service. Thermometer arrived within 48hrs. I've had several oven thermometers over the years but this one seems to be to be very good. I like it as it has both celsius and fahrenheit on it. The colours and numbers are bold and clear and I can hang it on the rungs of the shelf or stand it up. Haven't overcooked anything yet... so must be good!. The delivery was excellent too... very quick. The item was quickly despatched by Thermometers Direct. Needed it to check on the temperature in a recently repaired Combi Microwave Oven. it did the job and seems robustly constructed and quite stable. Hsaven't had time to try it yet but leasedit was delivered promptly. Appears to be accurate as far as I can judge but sadly it would rather fall over than stand up, If hung from a shelf it's facing side on and can't be read. Well, not by me anyway but I'm no spring chicken. Service was excellent. Sorry to hear about the thermometer, We had no other reported issues with these, being a tray type thermometer the metal based can be bent and adjusted to stablise the thermometer in the oven. The unit is well made and appears to be accurate when checked against a digital oven temperature unit. Thanks - came in good time and looks just the ticket.